Dublin: Liuke, White and Company, 1787. Full leather. Very good. Dublin: Liuke, White and Company, 1787. Full leather. two volumes. Octavo. Letters on Egypt with a Parallel Between the Manners of it Ancient and Modern Inhabitants, the Present State, the Commerce, the Agriculture, and Government of that Country, and an Account of the Descent of St. Lewis at Damietta; extracted from Joinville, and Arabian Authors. Illustrated two fold out maps and one fold out of great Pyramind. 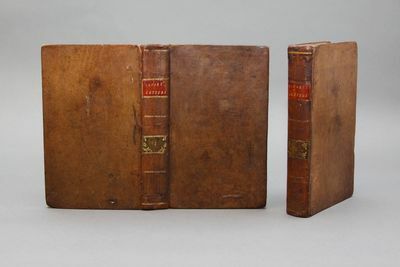 Bound in full brown leather, spine gilt red and green title label.